Maybe the reason I keep coming back to Cecil Sharp’s musical journeys into the Southern Appalachian mountains is because he tended to be the most open-minded ballad collector about his subjects who gave so freely of their song repertoires. This afternoon I’ve been re-reading Maud Karpeles’ 1967 biography of Sharp (a hard-bound, first edition copy lovingly preserved in the archives here). 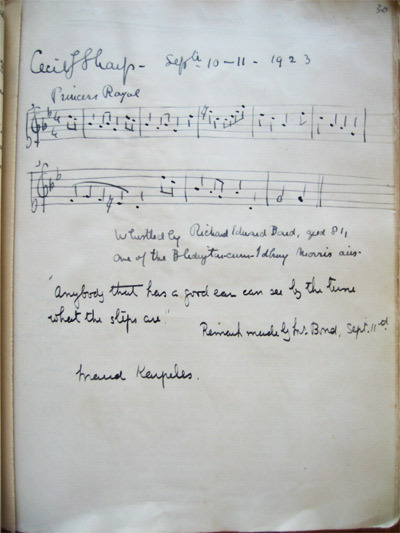 Karpeles (1885-1976) was Sharp’s assistant, travelling companion, and fellow musicologist/scholar. She became his literary executor on his death and published what is still considered the definitive biography on Sharp, Cecil Sharp: His Life and Work. This entry was posted in Uncategorized on June 23, 2009 by Marianne Worthington.